The H-Drive™(HD) is a high performance, low cost, C/C++ programmable embedded controller based on a 40 MHz 16-bit CPU. It is intended for networking industrial process control, data acquisition, and especially ideal for Human Interface Device(HID) OEM applications. 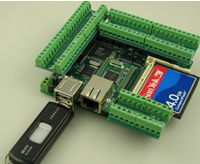 A Fast Ethernet Module can be installed to provide 100M Base-T network connectivity. This Ethernet module has a hardware LSI TCP/IP stack. It implements TCP/IP, UDP, ICMP and ARP in hardware. It releases internet connectivity and protocol processing from the host processor, which represents a huge improvement over software-based TCP/IP stacks. The resulting system can easily handle transmissions in the 100KB/s+ range in real world applications. A Host USB controller can be installed to provide two Host USB Ports. Port1 can interface to a USB keyboard/mouse. Port 2 supports a USB Flash Disk. Simple commands can handle FAT file system applications. No USB specific firmware programming is required on the controller side. A 24-bit ADC(LTC2448) offers 8 ch. differential or 16 ch. single-ended input channels. A peak single-channel output rate of 5 KHz can be achieved. A 12-bit ADC (TLC2543, 0-5V) provides 11 ch. analog inputs at up to 10K Hz sample rate. A 16-bit DAC(LTC2600) provides 8 analog output voltages (0-5V). The HD supports up to 2 GB mass storage CompactFlash cards with Windows compatible FAT file system support, allowing user easily transfer large amounts of data to or from a PC. The HD features 16-bit ACTF Flash (256 KW) and battery-backed SRAM (256 KW). It also includes 4 TTL I/Os, 3 timers, 512 bytes EEPROM, watchdog timer, and Real Time Clock(DS1337). There are a total of 6 UARTs on board: 2 from the CPU chip, 4 from QUART chip(TI16C754B). By default all UARTs are supported by RS232 drivers. Two of the QUART RS232 ports can be converted to RS485. Seven high voltage I/Os (30V DC inputs or 50V sinking outputs) are included. Optional 8 sourcing driver can be installed. Two mechanical Reed Relays provide reliable, fast switching contacts with a specification of 200 V, maximum 1 Amp carry current, 0.5 Amp switching, and 100 million times operation. A Color TFT display (320×240 pixels, 5.7″, No touch screen) can be installed. Aluminum Bezel and plastic enclosures for the 5.7″ display are available. The HD can be powered by regulated 5V, or 9-12V with on-board linear regulator, or 9-24V with optional switching regulator. The HD works with most TERN expansion boards including the P52, P100, P300, MotionC, MMC, UR8, and EyeJ.